The opposite side of customer retention is customer attrition or churn. For app developers, churn means that users become inactive or leave an app sometime after the install. After all the cost and trouble of acquiring users, this is a highly unlucky outcome. To keep as many users as possible, it’s vital to understand what makes them stay and what makes them leave. The churn rate is a highly useful metric that helps to improve the app and make sure that the monetization strategy works. Why churn rate is so important? App developers tend to focus on app installs. However, a high number of new users doesn’t automatically guarantee great monetization results, if those users never open the app. 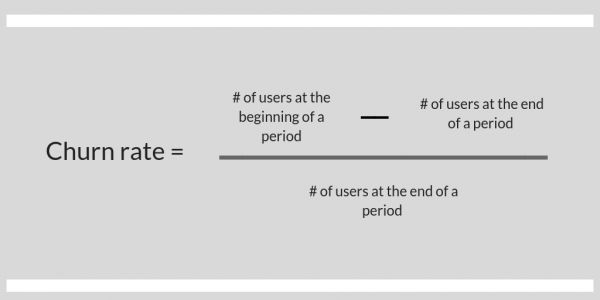 User retention is the path to increasing app revenue and lifetime value of each user, plus it helps to decrease the overall cost of user acquisition. However, retaining users is just a part of the strategy. Developers should take specific steps to prevent them from leaving. Churn rate is the metric that can give valuable insight into the app performance. Churn rate is a signal that can show you where to pay attention, to fix issues in your application. Having calculated churn rate, app developers and marketers access a wealth of valuable insights that should inform the monetization strategy. In the most basic terms, churn rate is the ratio of users that have abandoned the app to the number of users that continue with the app. This calculation serves as a basis for understanding how your app performs. However, the nature of user engagement is more complex. 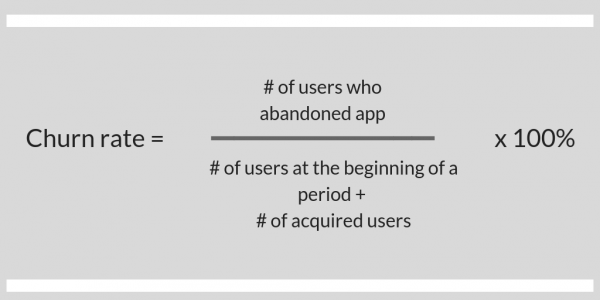 If you’d like to have insights into why users churn, you’ll have to dig deeper and use formulae that take into account more variables, than just acquisition and abandonment. The data that factors in can include the frequency of app usage, payment data, geolocation, customer segmentation data, etc. Overall, the more data you have, the more nuanced the insights are going to be. For predicting churn rate, it is possible to build a model with many variables. However, such a model can only offer a certain degree of reliability, usually, no more than 85 percent. There are many variations of the basic churn rate formula and many marketers like to develop their own calculations for their specific purposes. 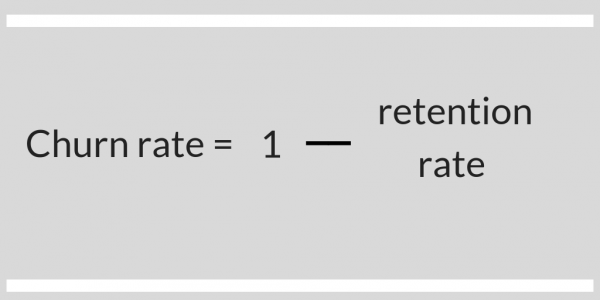 Here are the three variants of the simple formula of churn rate. 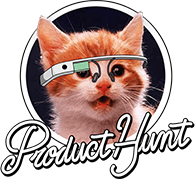 The reality of user engagement is nuanced, as each user has a unique history of interactions with the app. However, to discover trends and their interdependence, app developers can segment users into groups and calculate churn rate for each group separately. Thus they can see how each cohort performs over time. Users can be grouped by the day of install or the acquisition channel or other characteristics – it is up to app developer to decide which hypothesis to test. Cohort analysis can be visualized in a graph like the one below. Churn rate per se wouldn’t give you much information unless you have other data to compare it to. Naturally, some types of apps are built to support long-term user interactions while others are aimed at a shorter attention span. Therefore, what is normal for one app can be a worrying trend for another. 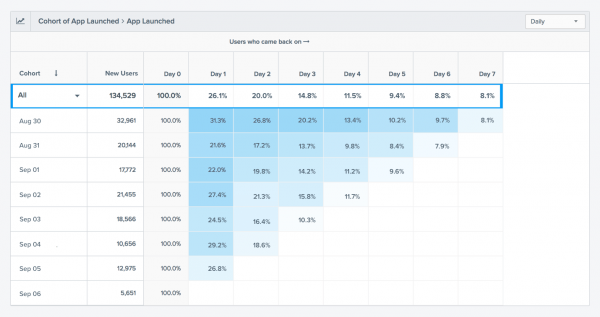 The first thing to know about the churn rate is that it’s generally very high in relation to the general number of users. The majority of users will abandon your app directly after install. The average churn rate across all industries within 90 days is assessed between 71 percent and 80 percent. After 90 days, the churn rate is even higher, with only 4 percent of users returning to app both on Android and iOS platforms. In fact, close to 80 percent of daily active users churn within 3 days after install. Breaking down statistics by the app category, there are clear leaders. According to Statista, the lowest churn rate by day 1 is observed in the Hobbies, Games and Lifestyle categories. By day 30, the apps in Finance, Education, and Travel categories perform the best. 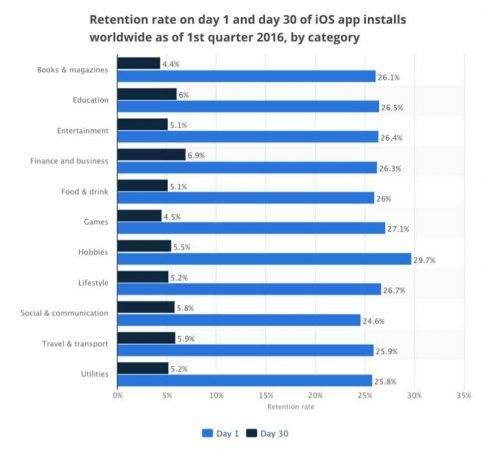 At the same time, the lowest retention rate shows the apps in the Travel and Utility categories on day 1, and Games and Books apps by day 30. By the estimations of a 90-day usage period, apps in News, Communications, Sports and Weather categories are among the most sticky. Meanwhile, the biggest number of users abandon apps in Music, Personalization and Photo & Video categories. The comparison between apps is also imperfect. Keep in mind that the top apps retain up to 70 percent of users within 3 days, while the next 5000 apps retain just 28 percent. It’s a very distinct disparity, which illustrates how churn rate depends on the competition and the ability of the app developer to offer users either impeccable experience or some unique features. Churn rate is one of the basic metrics for an app developer. Along with retention rate and LTV of a user, churn rate informs about the performance of the app and the monetization opportunities. Calculating churn rate is not enough – you have to understand what it means for your platform, category and app type. Then, with the data in hand, you’d be able to make informed decisions about optimizing your app for users.